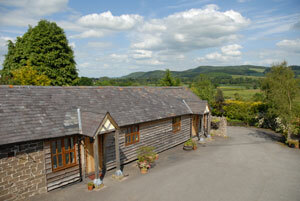 A right royal welcome awaits you at The Dairy and The Byre, luxury 18th Century barns adjoining the owners house. The accommodation is on the ground floor with only shallow steps to the front doors. Surrounded by an area of outstanding natural beauty (AONB) in an elevated position halfway between Ludlow and Church Stretton and 1 mile from Craven Arms they are very cosy, with underfloor heating and lpg fires. 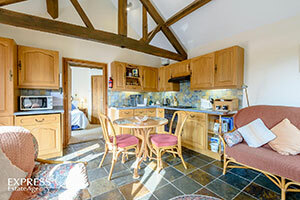 The self catering holiday cottages, each with one double bedroom/ensuite shower room, are south facing on a level site with a large parking area and secure garden. 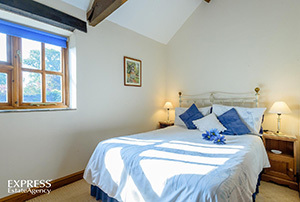 Under a mellow Welsh slate roof they have waney edged timber in the local style, exposed stone walls, vaulted ceilings with many original oak beams, oak kitchen units, slate floors in the living areas and carpeted bedrooms. 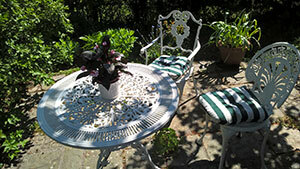 Separate patios with Coalbrookdale furniture overlook the cottage garden and the surrounding countryside. The Dairy (sleeps 2 + cot) has views over the former farmyard and beyond over Stokesay to Whitcliffe and the Mortimer Forest. The unsurpassable 12th Century fortified manor house of Stokesay Castle is close by and Craven Arms, one mile away is home to South Shropshire's award winning Shropshire Hills Discovery Centre and the Land of Lost Content Museum. It also has a supermarket, shops, post office and bank and a main line railway station on the Manchester - Cardiff route. BBC TV's Victorian Farm location is just a few miles to the north and Ironbridge Gorge with its' ten museums is eastwards along Wenlock Edge. Much Wenlock, a scenic country drive away, was recently named by Sunday Times and Savills Estate Agents, as one of the best British villages to live in. Much Wenlock is the birthplace of William Penny Brookes, recognised as the founding father of the modern Olympic Games. The Wenlock Olympian Games are still held in July each year and the joint Mascot of the 2012 London Olympic Games was named Wenlock. Right outside the gate to Highgrove and into Long Lane, the old Turnpike road is now a quiet byway and turning in either direction leads to wonderful walks or cycle rides up to Wart Hill and beyond or down to the River Onny meadows. A twenty five minute stroll towards the Long Mynd brings visitors to Wistanstow, famous for The Plough Inn and Wood's brewery, home of the prize winning Shropshire Lad and many other real ales. Talking of which, A.E.Housman's inspiration for his poem A Shropshire Lad, the villages around Clun - "the quietest under the sun" - are westwards just over Hopesay Hill and still sleepy timeless places for peaceful contemplation. Buzzards circle overhead and you may catch sight of Red Kites, Wheatears, a Kingfisher or a Dipper and experience the liquid notes of the Curlew over the meadows or even foxes and badgers sporting themselves in broad daylight. Within a few minutes drive are Cardingmill Valley and Church Stretton, known as Little Switzerland and Ludlow, reputed by many to be the finest medieval town in England. Famed nowadays for its 'foodie' restaurants it still holds its ancient street markets several days a week and annual culture and food festivals centred around its magnificent lofty castle. There is however, no necessity to travel far for good food as pubs and restaurants serving a range of mainly locally sourced foods are within easy reach . A Rare Breeds Society butcher, a rarity in itself, is based in Craven Arms. Ancient churches abound in idyllic towns and villages as well as modern, lively places of worship in local communities. Ironbridge's World Heritage sites are a forty minute drive away close to Telford, with its shopping malls and large town attractions. North and South along the A49 are the county towns of Shrewsbury and Hereford respectively. Craven Arms itself is known as the gateway to the Marches, as this Welsh border country has been referred to over the centuries, and many villages have Welsh names although nowadays firmly in England. We warmly invite you to come and sample the hospitality and friendliness of this relatively undiscovered, but stunningly beautiful part of Britain, and to stay with us at Highgrove whatever your interests and at any season of the year - this is truly an all-year-round holiday place.